Madeira is the ideal destination, not only for the mildness of its climate and exuberance of its flora, but also for its gastronomy, a wide variety of regional dishes that we can find. The appetizing menus will help make your stay on this island an unforgettable culinary expedition, you will find many typical dishes, fish or meat, deliciously prepared variously, not to mention the excellent wines to accompany your meal. The wide choice allows every day to try something new. The sea is a natural extension of Madeira and the fishermen know very well how to take advantage of it. Fresh fish arrives at the Funchal markets and other coastal cities every day. The best dishes are fresh tuna, fried horse-mackerel and swordfish “Espada” served with passion fruit, banana or stew. The true gourmet know enjoy the famous “Tuna Steak” or the exotic taste of “Mackerel with villain sauce“. Simple recipes but with fresh ingredients are the secret of Madeiran cuisine. Most speciality is Espetada, made with beef cubes in a laurel skewer and grilled on wood or charcoal. Many restaurants have tables with iron structures applied in the center, to hang long blond skewers in which broil the meat pieces. As follow the locals suggest the Fried Corn “Milho Frito” and Bolo do Caco, traditionally baked in a tile bit on fire. The other specialty of the island is the “Carne em vinha d’alhos ”meat in wine and garlic, usually food on Christmas Day and prepared with spicy pork with garlic. There is also the “Cozido à Madeirense“, composed of various types of vegetables, meat sausages. For those who really want to appreciate something unique, it is necessary to experience the “Madeira Açorda stylish” or even the “St. Martin Codfish“, a speciality of the village located west of Funchal. Finally, will not resist the temptation of a divine dessert. Tropical fruits that grow on the island, such as bananas, mangos, papayas, pomegranates, grapes and avocados are undoubtedly a delight endless. Why not try the tabaibos, also called “figs of the devil”? These fruits, from a species of cactus, are appreciated for their juicy freshness. Many of these fruits are used for making puddings and ice cream or ice cream. In the confectionery stand the local cheesecake “queijada”, which is sublime and the famous honey cake. Honey cake dates back to the time when the island played an important role in the sugar trade. This regional sweet is traditionally associated with Christmas and is a perfect accompaniment to taste Madeira wine and homemade liqueurs, such as mandarin and passion fruit. Porto Santo there is a wide choice of regional dishes, but that there are delicious. The local lobster is called Babble. Extremely tasty but hard to find. 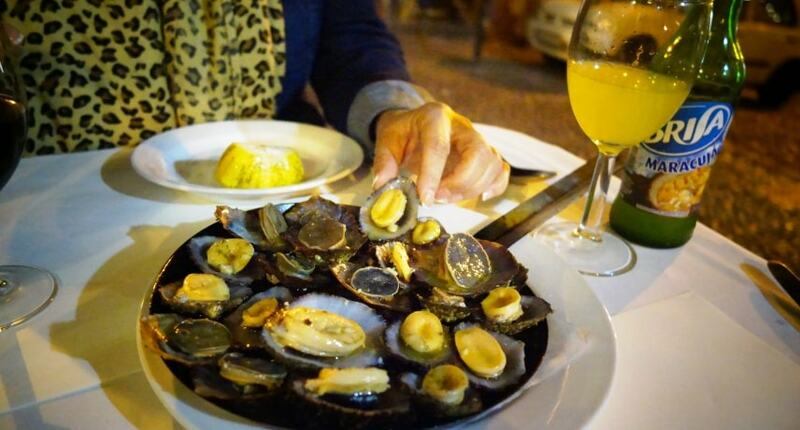 The best specialities include various octopus dishes, roasted chicken and “espetada”. as the fruit, all of it is fresh and sweet, from the grapes to watermelons, melons and figs. Whatever the visitor’s taste, certainly will be to worship the Madeiran food!